In 1987 I was at an anti-fascist friend’s house when he produced a very large bound volume for me to peruse as bed time reading while I was staying in his spare room. The volume contained a large run of a magazine called Democratic German Report. 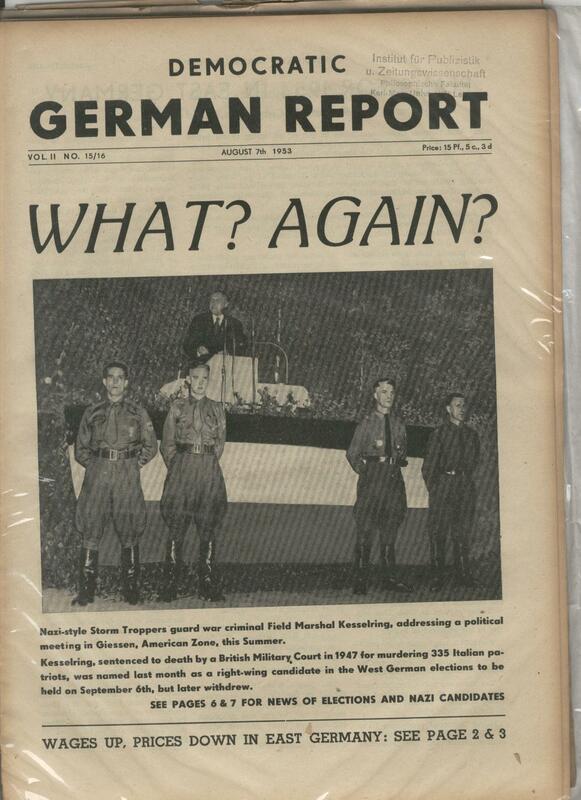 Democratic German Report was an English language newsletter, produced in the German Democratic Republic, which among other things exposed former Nazis working in all sorts of important positions in West Germany. The publication was run by John Peet. Formerly a Reuters journalist based in West Berlin, Peet decided to live in the GDR after being sickened by West German rearmament. Peet had fought against fascism with the International Brigades in Spain and had also covered the Nuremberg Trials as a journalist, so had a deep hatred of fascism. Between 1952 and 1975 Peet produced Democratic German Report, exposing former Nazis, German revanchism and neo-nazis. All written for an English speaking audience. I have no doubt that early editions of the monthly Searchlight Magazine, which coincidentally appeared the same year that Peet’s publication ceased, was strongly influenced by his work. The exposé style is certainly very similar. While Democratic German Report was useful propaganda for the East German regime, Peet was actually quite critical of the regime. However, he was probably lucky to have passed away in 1988, a year before the collapse of the country. German reunification, with no discussion of why the country was divided in the first place, would have been a bitter blow I think. Peet’s brother was the documentary maker Stephen Peet, who I mention in my previous blog post here. He probably wasn’t too pleased to have been blacklisted by MI5 because of his brother’s activities. This entry was posted in Blog and tagged anti-fascist, fascism, German Democratic Republic, John Peet, nazi. Bookmark the permalink. I used to read the report. One day I was reading a copy on the Tube in London when a man asked if he could have a look and taking it from me tore it up. For me that cnfirmed Peet’s fears. It certainly touched a raw nerve exposing Nazis in high positions including their party numbers. So many would like to forget!